This is the same course that I developed with the faculty of the Maryvale Institute in Birmingham, England before moving to the United States three years ago. It is now offered in the US as well through the Maryvale Centre at the Diocese of Kansas City, Kansas. The Maryvale Institute is the only Higher Institute of Religious Sciences with pontifical status in the English speaking world. It is good news that itss courses are now offered in the US via the Diocese of Kansas City, Kansas. This is not your standard online course - the Maryvale Institute has developed its own method of teaching at a distance through use of expertly designed coursebooks and attendance periodically at residential weekends. Termed 'collaborative learning' that is so effective that they view it as superior to the education recieved at conventional full time courses. The recent awarding of pontifical status - it has been created a Higher Institute of Religious Sciences by the Congregation of Catholic Education in Rome - is recognition of not only of its faithfulness to the Magisterium of the Church, but also the standard of excellence in the teaching offered. 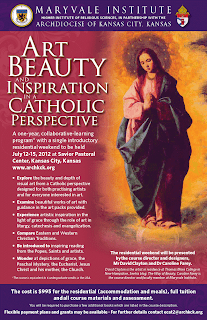 The opening residential weekend for their course, Art, Inspiration and Beauty in a Catholic Perspective takes place in Kansas in July is intended both for working artists and those interested in art (with the thought that you might become the future knowledgeable patrons of the art). The weekend is run by course director Dr Caroline Farey with whom I worked closely in Birmingham when the course was first launched and I will teach too. Maryvale's mission is to deliver degree level education to working, mature students. As such it is designed so that no previous qualification is required in order to attend this course. The teaching method works from first principles and so anyone with the innate ability, almost regardless of previous levels of education, will flourish. European readers should be aware that the course is still offered through the Birmingham campus of the Maryvale Institute in England. 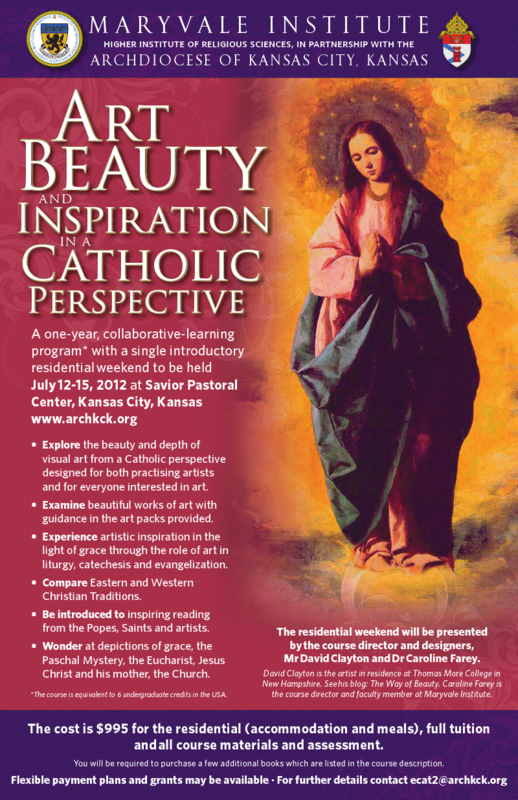 For further details contact ecat2@archkck.org and information about this and other courses offered by the Maryvale Institute Centre in Kansas City can be found here.